Who will take New England? A tight race between two cheeses. As election day gets closer, we decided to take a poll on three artisinal New England cheeses: Vermont Dandy (sheep's milk, upper left), Bartlett Blue (cow's milk, upper right), Hillman Farms Chevre (goat's milk, lower left). Three average Joe the Plumbers gathered on an unseasonably warm fall day in Boston to focus on the issues: taste, texture, and price. The consensus among the tasters was that the Vermont Dandy (Townsend, VT) was a fairly run of the mill sheep's milk cheese. 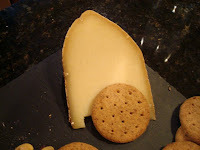 The tasters felt that it lacked the sharp and buttery taste of a rich Manchego. Hillman Farms (Colrain, Massachusetts) chevre captured the attention of all the tasters. 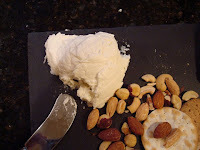 It was an exceptionally creamy and flavorful chevre, but without bearing the burden of excessive tanginess or sourness. It's unique among chevres that the tasters have tried, and it was the favorite of two out of the three tasters. Bartlett Blue (Greensboro, VT) was the favorite cheese of the other taster. It was mild for a blue cheese, without the overpowering taste of many roqueforts and gorgonzolas. The taste was complex with a satisfying aftertaste. Even one taster who claimed "I do not like Blue cheese!" enjoyed the cheese after tasting it. The Vermont Dandy was semi-soft, and a little grainy, with a non-descript rind. Hillman Farms chevre was very soft, with almost the consistency of a bagel cream cheese spread. While the first two candidates appeared soft, the Bartlett Blue presented a hard facade, perhaps in an effort to distinguish itself from the others. 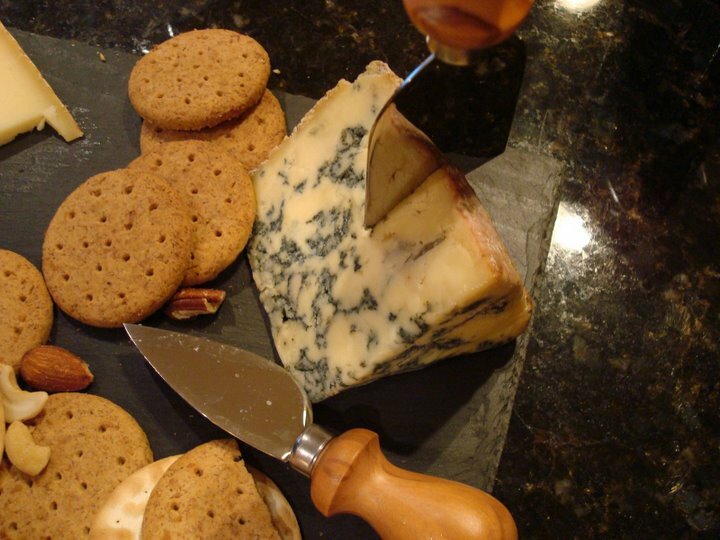 Like a Stilton Blue, this was a hard cheese, but not aged and it did not crumble. 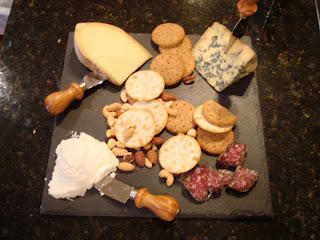 In the end, the texture of the Hillman Farms chevre was the only one that moved the tasters. At $29 / pound, and with the run of the mill taste of a grocery store sheep's milk, we felt that it was not worth issuing fromage-backed securities in order to raise capital. Bartlett Blue was a delicious cheese, but the cost was $25 / pound, perhaps out of range for Joe the Plumbers to consume on a regular basis. With gas prices falling, we think we can afford Hillman Farms chevre at $19 / pound. It is an unique, enjoyable chevre which we would certainly buy again. Overall, the tasters thought it was a very tight race between the Bartlett Blue and the Hillman Farms Chevre. Ultimately, on election day, you will decide who the winner is. While traveling in DC it turns out that Cheese Whiz has been working on handmade, slow rise pizza crusts. He suggested we make the pizza with said crusts. I suggested we work Fromage in and do a taste test of cow mozzarella against buffalo mozzarella just to see if neophytes can taste the difference. So off we went to the massively yuppie and overpriced "Dean and Deluca" to find buffalo mozzarella. We got seven ounces of "freshly imported all natural" Bufala mozzarella, made from the water buffalo for $12. We also got eight ounces of "Dean and Deluca" cow mozzarella for $5. Interestingly, although about the same weight, there was much more of the cow mozzarella, almost two to one. Already there's a significant difference in density (four to one in cost!). In terms of the raw product, the buffalo was clearly superior both in taste and smell. The cow mozzarella was almost tasteless, while the buffalo was sharper, cleaner, and full of flavor. When I laid it on the pizza there was also a distinct texture difference. The cow was rather stringy while the buffalo was sort of mushy. Purposely we made the pizza simply: just tomato sauce and cheese. We laid it on the stone at 500 degrees and waited a few minutes. When the pizza arrived, there was also a clear difference between the cheeses. The cow was much brighter white in the end. The real question though: after baking is the buffalo as delicious? Sadly, no. The buffalo was certainly better tasting: richer, fuller, and with more depth. But neither of us thought that the cost difference outweighed the taste difference. In short, the difference between the raw and cooked cheeses did not outweigh the cost difference. However, we certainly think that a delicious sandwich / caprese salad could benefit greatly from fresh buffalo mozzarella.